Energy World Corporation has confirmed that subject to shareholders' approval and due diligence, Orchid Fund Pte Limited and Energy World International Ltd. will each contribute US$15 million to each earn a 15 per cent interest in the Abbot Point LNG facility and pipelines project in Qld. The retail component of Transpacific Industries' entitlement offer raised $44 million, a 66 per cent take-up by eligible shareholders. The balance of the shares achieved a clearing price of 72 cents per share in the retail shortfall bookbuild, which was equal to the last closing price and a 17 per cent premium to the theoretical ex rights price. Retail shareholders who did not take up their entitlement will receive 22 cents for each new share not taken up, a total of $6.5 million. Transpacific has bought back $159.45 million in face value of its outstanding 6.75 per cent Subordinated Convertible Notes due 2014. The price was 99 per cent. The Notes have been cancelled. Ceramic Fuel Cells chairman Jeff Harding has again highlighted the lack of a feed-in tariff for the company's fuel cell technology that was developed in Australia. "This means that if you have a BlueGen unit in your home, there is no requirement for the energy companies to pay you for the power you send back to the grid," he told shareholders. "Because of this, we are marketing BlueGen in Australia principally to commercial customers who can use all the power produced by the BlueGen on-site." The Victorian Government said it will look at extending Victoria's feed-in tariff to include fuel cells, and the company is now awaiting action on this. Meanwhile sales overseas are gathering momentum. "Over the past year we have increased our orders nearly ten fold  from 53 units in October last year, to more than 500 units today. Our sales revenue for the 2011 financial year was 81 percent higher than 2010. "Many of our early sales have been effectively for demonstration purposes. These sales have produced follow-on orders. Our most recent orders are in the 100s of units. The order book comprises just over 200 integrated power and heat generators and over 300 BlueGen units for delivery over the next year. 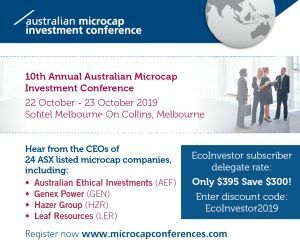 Energy industry publisher Energeia says the emerging market for micro-scale Combined Heat and Power (mCHP) is the most prospective fossil fuel based option for personal power production in Australia. CBD Energy is not proceeding with the acquisition of Neighbourhood Energy and said it will develop an alternative strategy for establishing an energy retailing operation. It will fund the new strategy from cash flow, which it considers a more cost effective way of entering the energy retailing market. Managing director Gerry McGowan said "The CBD Board took the view that it was more prudent to build a retail business from the ground up. To that end, we have engaged Tim Hunt-Smith who was previously chief executive officer of Neighbourhood Energy to lead this initiative. "We intend to deliver a green energy retailer that will market and install our roof-top solar systems as well as distribute the wind power generated from AusChina's wind farms. I am convinced this business can grow into a major contributor for the CBD Group." On developments, Mr McGowan said "During the 2012 year, you will see our solar business go global. We expect up to 50 per cent of our revenues to come from our international projects. As most of our products are purchased in US$ or euro currency, this will minimize our currency risk. Additionally, Government policy settings are much more mature and stable internationally. Our pipeline of projects is significant. Whilst market conditions remain tough, we are confident that we will deliver a good result this year and grow on the sound base established during 2011." The solar project in Thailand is in its final three months due diligence and if all is well CBD will receive the final $2.5 million on the $25 million project. AusChina Energy now expects to commence construction of its $250 million Taralga wind farm in February 2012. Mr McGowan criticized Australian governments for their inconsistent policy settings, saying "more jobs have been lost from the solar industry in the past year than the steel industry. Clear Solar, The Solar Shop, Well Being solar and DCM Green have all folded during the year." Clean TeQ Holdings is hoping for a better year than last year and so far year to date contracts total $9 million compared to 2010-11 revenue of $6.6 million. CMA Corporation has appointed John Pedersen as chief executive officer, effective from January 2012. Mr Pederson has considerable metals recycling experience and held senior positions with major shareholder, Scholz Group. CO2 Group has raised $17.9 million through the exercise of listed options at 12 cents each. The company said 96.5 per cent of the listed options on issue were exercised. The Group's cash position is now $34.5 million. Any listed options not exercised have now expired. Gabor Holdings Pty Ltd and its associates increased their holding in CO2 from 42.3 per cent to 48.1 per cent. Four CO2 directors also exercised significant numbers of the options. CO2 Group subsidiary CO2 Australia has been appointed by the Tasmanian Government to undertake a Forest Carbon Study to estimate the volume of carbon currently stored in Tasmania's forest estates. The study is seen as an important project for Tasmania given the recent passage of the national carbon pricing legislation. CO2 Group said it is also evidence of its continued diversification of revenue streams, the strength of its advisory services team and the significant carbon project expertise that it has developed. The Forest Carbon Study will provide an independent, expert assessment of the volume of carbon currently stored in Tasmania's forest estate, and the most significant opportunities to reduce greenhouse gas emissions and increase carbon sequestration in the forest sector. The study will also look at opportunities for Tasmania to monetize emission reductions in the forest sector. The Tasmanian minister for Climate Change, Cassy O'Connor, said "The UN Intergovernmental Panel on Climate Change (IPCC) makes it clear that better forest management and protection is key to avoiding dangerous climate change. There are, however, significant gaps in our understanding, as well as scientific dispute over the emissions and carbon sequestration value of Australia's forest estate, and this is particularly relevant to Tasmania. "This Government recognizes that Australia's current emission accounting rules, dictated by international agreements, are inadequate, in that they do not account for sequestration across forest types, forest management practices or for avoided deforestation. "There is vigorous scientific debate and a number of points of difference on this important issue, which is why the work to be undertaken by CO2 Australia in Tasmania is both timely and necessary." DoloMatrix International has received a first strike against its remuneration report with a 31 per cent no vote. Environmental Group said it is on track to deliver an operating profit for the December half, where it had a loss for the 2010 December half. Results for first quarter to 30 September show revenue of $10.1 million against $7.1 million for the previously corresponding first quarter. The unaudited operating profit before tax for October exceeded budget. ERM Power is studying the feasibility of building a 500 MW gas-fired power station at Portland in Victoria to support its growing retail sales in southern states. Managing director and chief executive Philip St Baker said ERM Power is holding preliminary discussions with Alcoa of Australia about establishing a peaking power station near the Portland Aluminium smelter. ERM Power has been looking at opportunities in Victoria for some time, and if it proceeds it would be ERM's first power station in Victoria. The power station would require development approval and would not go ahead until it is required by the market which, based on current forecasts, could see commercial operations from 2015 or 2016, he said. Meanwhile, the company has extended its relationship with Woolworths by signing an electricity sales contract valued at about $140 million over three years. The contract, starting on 1 October 2012, covers about 360 Woolworths sites in Victoria including. The contract will make Woolworths one of the company's top 10 customers and its largest in Victoria. Solco is to raise $4 million by way of a non-renounceable underwritten rights issue on a 2 for 7 basis. The rights issue is priced at 7 cents per share and underwritten by Investorfirst Securities Limited. Executive chairman David Richardson, who will take up his full entitlement, said the funds will assist with the acquisition of businesses or business assets if the right options come along, and for working capital. "Solco is being presented with a range of exciting opportunities for acquisitions as well as new business opportunities and the Board wants to be in a position to capitalize on them, if they fit the company's vision going forward." he said. The first photo-bioreactor module has been shipped from Algae.Tec's Algae Development & Manufacturing Centre in Atlanta, Georgia, for Australia. Executive chairman Roger Stroud said the shipment is one of five that will be delivered over the next few weeks for the Shoalhaven One Australian showcase facility at Nowra, south of Sydney. Shoalhaven One is sited next to the Manildra Group's industrial facility. Manildra Group is the nation's largest ethanol producer. AnaeCo's shares hit a new all time low of 4.5 cents on 25 November. Carbon Conscious has raised $1 million through a placement to sophisticated investors and is aiming to raise another $2 million through a pro rata renounceable rights issue on a 1 share for 10 basis. The issue price is 28 cents per share. The placement will fund the company's forestry operations for the 2012 planting season and beyond, and create additional forestry capacity to meet the future demand for carbon abatement projects. The rights issue will fund deposits for future land acquisitions, purchase seedlings for the 2012 planting season, and provide working capital. Cell Aquaculture is undertaking a non-renounceable entitlement issue on a one for four basis at 4 cents per share. The offer is underwritten to $500,000 by John Oakley Clinton. The closing date is 19 December. Tata Steel and Dyesol say they have been undertaking an exciting stage of industrialization of dye solar cell (DSC) on steel at the PV Accelerator in Shotton in North Wales since the completion in July of the Welsh Government supported project. The challenge has been to create the biggest and best DSC modules utilizing the pilot production line, and the team will achieve these goals in under four months, they said. The team has been constructing a 20 square metre DSC roof array that will be demonstrated and monitored at the Sustainable Building Envelope Centre (SBEC) test bed facility on the Shotton site. The demonstrates the capability to manufacture a module that can be integrated and installed as an operational array. It has also required the accelerated development of the product finishing steps. In parallel, the team has more than doubled the power output while eliminating costly silver conductors, they said. The major drive now is to bring forward the delivery of high performance matched by lower cost materials that will enable grid parity of DSC arrays integrated into steel roofing. This would make the Tata/ Dyesol products independent of the need for feed-in tariffs. Eco Quest received a strong no vote of around 27 per cent for its remuneration report. The re-election of chairman Sylvia Tulloch and director Gina Ferro also received strong no votes but were passed. Director Michael Greenup has resigned, effective immediately. No reason was given. The continuation of the company as a going concern is dependent on the raising of further capital. Shareholders will need to understand and accept that the IP and technology base of the business provides no sustainable advantage over the major competitors and therefore is likely to be high risk and volatile. Geodynamics and joint venture partner, Origin Energy, have settled the insurance claim to recover costs to replace Habanero 3 as a result of the well control incident in April 2009 and will receive a gross payment of $12 million and net proceeds of $10.8 million. This will finalize Parts B and C of the Habanero 3 insurance claim covering redrill and environmental expenses. Geodynamics managing director, Geoff Ward, said the Joint Venture is advanced in preparation for redrilling Habanero 4 which has been designed as a production well for the 1 MWe Habanero Pilot Plant and will be drilled as close as possible to the now suspended Habanero 3 well to effectively replace this well. The Habanero 4 well design and execution plan has incorporated all findings from the casing failure of Habanero 3. Geodynamics and Origin Energy are targeting the first quarter in 2012 to spud the Habanero 4 well. The target depth is 4,170 metres. Habanero 4 is the first step in an appraisal program to demonstrate a commercial reserve at the site. The $90 million Renewable Energy Demonstration Program (REDP) grant awarded to Geodynamics in 2009 will provide significant funding for the drilling of Habanero 4 and the forward work program. Under an arrangement with the Department of Resources, Energy and Tourism, Geodynamics will receive a greater proportion of the funds in the early stages of the project. The company expects to be able to draw down funds to offset up to 50 per cent of the cost of the appraisal program activities over the next two years. Mr Ward said "Habanero is our most prospective location. At Habanero, Geodynamics has already flowed high pressure hot water at 216 oC at surface from a deep fracture zone in granite at 4,180 m at rates of up to 30 kg/s from hot granite rocks using enhanced geothermal systems technology." Green Rock Energy is undertaking a 1 for 3 pro-rata non-renounceable entitlement issue to raise $2,031,241. The offer price is 0.9 cents per share, and the offer is underwritten by Cygnet Capital Pty Ltd.
One free option will be granted for every new share, exercisable at 3.6 cents by 31 March 2013. The funds will provide working capital to progress the company's geothermal and hydrocarbon projects, and assess and progress potential new opportunities. Hot Rock has raised $340,000 through a placement of 13.6 million shares to directors, director related entities and sophisticated investors, and has extended the closing date on its share purchase plan to 9 December. The placement and share purchase plan shares are priced at 2.5 cents each. The funds are for field and community consultation activities for future geological, geochemical and geophysical studies in Chile and Peru; investigation of additional geothermal opportunities in Chile and Peru; and working capital. Intec received a 30 per cent vote against its remuneration report. The chairman, Trevor Jones, struck a positive note, telling shareholders that the company would welcome consultation with them concerning how the remuneration report might be improved next year. "Over the next year, the company's directors will work hard to earn the support of all shareholders by advancing good projects, seeking to increase the company's share price, and fairly and reasonably remunerating the directors and executives who achieve this," he said. The approval of options for directors also received a strong no vote but were passed. The EAF dust blending operations have commenced in recent days at the company's Victorian stockpile site, he said, and as the production and sale consumes that stockpile, it is expected to release up to $3.6 million in additional environmental bonds over the coming year or so. Intec is blending the EAF dust with Zeehan Residues to make a specified zinc concentrate for export to China. The company expects to make an announcement in the near future about the receipt of the first staged payment for 50 per cent owned subsidiary Intec International Projects Pty Ltd's new minerals project in the Middle East. The contract covers a full testwork and engineering program for the implementation of the first stage of the lead and zinc waste project. The signing of the contract was the culmination of five years of work, said Mr Jones. In 2010-11 Intec entered a collaboration agreement with Energy Booster of Organisations in Europe, or EBOO, to advance a new industrial waste recycling opportunity for the Intec Process in rare earth metals. EBOO has invited Intec to evaluate a waste stream containing economic levels of neodymium and dysprosium - valuable rare earth metals used in the manufacture of high-strength magnets for environmental applications like wind turbines and electric cars. The waste goes to landfill as it does not currently have a viable recycling alternative. It is free of the radiation hazards that can be associated with rare earth ores, and early testing has shown it to be amenable to Intec Process recycling. Nine new contracts for embedded networks have seen Intermoco's number of embedded networks rise to 23. "We are now getting some real traction in the market with this model," said chairman, John Evans. "Estimated annual revenue from the embedded networks in place has correspondingly risen from $365,000 at June 2010 to $6.2 million today. Note that these revenue figures reflect the estimated annual amounts after the site reaches its projected level of tenant uptake," he said. Andrew Meehan has resigned as a director of Intermoco. KUTh Energy has had its geothermal licences in Tasmania and Vanuatu extended. The Tasmanian government has extended KUTh's key exploration licence area (SEL26/2005) in the central and north-eastern region of Tasmania by five years from August 2011 to 31 July 2016. This will allow KUTh time to undertake the next stage of its exploration programs. KUTh has identified two inferred resource targets in the tenement. KUTh has also surrendered areas near Hobart and Launceston that it believes are no longer of geothermal development interest. The Vanuatu Government has extended KUTh's key prospecting licence at Takara, North Efate (GTPL 29001) for another 17 months to 1 October 2013. The licence includes all three of KUTh's identified inferred resource targets and potential drill sites. The extension was granted to cover the period that the company has been sidelined awaiting the finalization of the World Bank energy review and the regulatory review process on energy tariffs. The extension period will enable KUTh to finalize power off-take and commercial arrangements and proceed through the next stage drilling programs, said the company. The World Bank's draft report into the energy needs of the island of Efate says that geothermal can play a role in driving lowest cost power efficiencies, carbon reduction and energy security. Shares in MediVac have almost halved in value since the share consolidation was completed in early November. After the one for 20 consolidation the shares had an equivalent share price of 4 cents, but this has quickly fallen to 2.5 cents and touched 2.1 cents on 16 November. The completion of grid auger drilling at Orocobre's Salinas Grandes Lithium-Potash Project in Argentina has confirmed the lithium grades and distribution of previous Orocobre pit sampling. High recoveries of both potassium and lithium could be expected using a simple, low operating cost, process route, said the company. (ASX: ORE). Panax Geothermal said it is one step closer to commencing development of up to 25 megawatts of geothermal power for PT Dairi Prima Mineral's (PTDPM) underground lead and zinc mine in northern Sumatra, with the approval of the final mining licences and permits for the mine by the Indonesian Ministry of Forestry. Managing director Kerry Parker said Panax has a Binding Terms Sheet Agreement with PT Bakrie Power and PTDPM for the supply of up to 25 megawatts of geothermal power to the mine, and the Terms Sheet Agreement is now being finalized into a formal Power Purchase Agreement. Once developed, the project will supply power to the mine at $US150 per megawatt hour for the first eight years and then $US125 per megawatt hour. Panax and PT Bakrie Power are also entitled to each receive 50 per cent of all carbon credits generated from the project. An updated Independent Resource Statement by Hot Dry Rocks Pty Ltd of Petratherm's key Paralana project in South Australia gives it a total estimated recoverable Resource of 38,000 PJth. Putting this into context, Petratherm said that the estimated 9,300 PJth that could be recovered from the 3,500 to 4,000 metre depth interval is sufficient to generate 1,300 MW of power generation for 30 years. This easily provides the potential for Petratherm's long term ambition of generating 520 MWe into the national electricity market. "This is equivalent to coal fired power generators burning approximately 650 million tonnes of black coal which will emit approximately 1.9 billion tonnes of CO2 into the atmosphere to generate the same amount of electricity," it said. The Update follows deep drilling, fracture stimulation and flow test operations at the project. The report has also increased resource confidence with close to half of the initial Inferred resource improving to "Indicated" and a smaller portion to "Measured" status. Phoslock Water Solutions has been awarded US and Canadian drinking water certification, allowing its Phoslock product to be used in all algae-contaminated water bodies, including those used for human drinking water. Managing director, Robert Schuitema, said "This is the US and Canadian Gold Standard for products used in drinking water consumed in those countries. It is internationally recognized as the highest standard set by water authorities. "The Water Quality Association (WQA), who awarded Phoslock this approval, is accredited by the American National Standards Institute (ANSI) and the Standards Council of Canada. These are the officially authorized water accreditation agencies in North America." Chairman, Laurence Freedman, said the certification should help accelerate commercial sales around the world. RedFlow has appointed Ken Smith as a non-executive director. Chairman, Peter Pursey, said Mr Smith is an experienced executive, director and company chairman, and has a successful and proven background in strategic planning and sales and marketing. "This is at a time when RedFlow has scaled up its own manufacturing, and is transitioning to outsourced manufacturing to meet expanded sales and marketing efforts both domestically and internationally," he said. "These skills and experience complement the existing directors very well." Style has been made exempt from antidumping tariff charges in the US following an investigation into multi-layered wood flooring imported from China. The ruling significantly strengthens the competitive position of Style's recently launched strand woven eucalyptus products in the US market versus imported Chinese engineered wood products, said the company. In November 2010, the Department of Commerce (DOC) initiated a large scale antidumping investigation on multilayered wood flooring from China involving over 200 Chinese companies. The DOC's final determinations were Countervailing Duty rates up to 26.73 per cent and Anti Dumping rates up to 58.84 per cent for multi layered wood flooring imported from China. Style requested exclusion from the investigation based on the unique and patented nature of its strand woven wood technology. WestSide Corporation said its second new Meridian SeamGas well has become a top producer and producing gas at increasing rates. Gas has been flowing at over 800,000 standard cubic feet a day (scf/d) from the new Pretty Plains 10 well with production rates continuing to rise as it de-waters, said the company. WestSide said the performance of Pretty Plains 10 builds on the recent successful commissioning of Pretty Plains 2 announced in September. The new well-sets are at Pretty Plains within the co-development area on the Dawson Coal Mine's Mining Lease near Moura in Queensland's Bowen Basin. Chief executive officer Dr Julie Beeby said"Both wells remain controlled via water and gas pressure, so they are expected to flow at higher production rates over the next few months as they are gradually allowed to flow freely." Chairman Angus Karoll told the annual general meeting that "The Directors are well aware of the prevailing weakness in WestSide's share price which has tended to reflect a sector-wide trend.